The greatest value of the Pennsylvania State Transportation Innovation Council is that it brings together diverse stakeholders to explore innovative approaches to improve the transportation system, says David Sanko. Sanko spoke at the nation’s first Innovation Showcase and Roundtable, held this summer in Harrisburg, Pennsylvania. After local, state and federal officials viewed exhibits of transportation innovations deployed in Pennsylvania, they discussed the advantages of developing a statewide culture of innovation. Federal Highway Administrator Gregory Nadeau (left) and U.S. Transportation Deputy Secretary Victor Mendez (center) view exhibits at the Pennsylvania Innovation Showcase. During the roundtable discussion, U.S. Transportation Deputy Secretary Victor Mendez and Federal Highway Administrator Gregory Nadeau recognized the Pennsylvania STIC as a national model in using state-of-the-art technologies on highway projects. The Pennsylvania STIC is part of a national STIC network that includes all 50 states, Washington, D.C., Puerto Rico, the U.S. Virgin Islands and Federal Lands Highway. STICs lead adoption of innovations that fit each state’s needs by considering information from sources such as the FHWA Every Day Counts initiative, American Association of State Highway and Transportation Officials Innovation Initiative and second Strategic Highway Research Program. 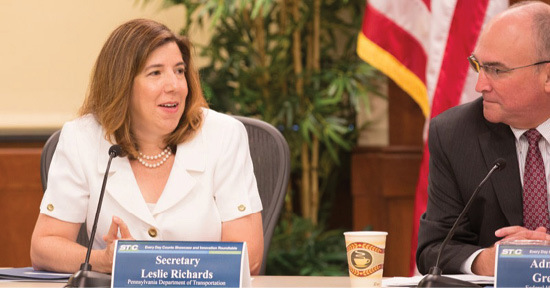 Pennsylvania Transportation Secretary Leslie Richards shares innovation success stories at a Pennsylvania STIC roundtable discussion. The STIC’s encouragement of innovations such as accelerated bridge construction helped enhance safety and reduce traffic impacts on a project in Lemoyne, said Michael Keiser, a Pennsylvania DOT district executive. The project used prefabricated elements and a crane to replace a bridge on Route 581 over 10th Street during four weekend road closures. Traditional construction would have required long-term lane closures and crews working near traffic on a road traveled by 84,000 vehicles a day. Involving universities in STIC conversations on innovation deployment enables academics to offer technical assistance, said Stan Caldwell, executive director of the Traffic21 Institute at Carnegie Mellon University. “It also gives faculty, students and researchers an understanding of the real-world problems that keep transportation professionals up at night,” he said. Nadeau applauded the state for using the Safety Edge™ —a paving technique that bevels the highway edge to make vehicles less susceptible to roadway departure crashes—on more than 500 miles of roads. He also highlighted the state’s use of high-friction surface treatments, a low-cost way to make curves and intersections safer, at more than 200 high-crash locations. These safety innovations, among others, have helped cut fatal roadway departure crashes in Pennsylvania by 12 percent since 2010. Nadeau praised Pennsylvania’s use of warm-mix asphalt, a group of technologies that allow asphalt to be produced and applied to roads at lower temperatures, reducing emissions and extending the paving season. The Pennsylvania DOT used warm-mix asphalt on 37 percent of its paving projects in 2014 and nearly half of all paving projects last year. Pennsylvania has also embraced adaptive signal control technology, which uses sensors to adjust the timing of traffic lights to enhance traffic flow. The Pennsylvania DOT has installed these innovative traffic signals at 190 intersections and plans installation at 246 more intersections. View the Pennsylvania STIC roundtable discussion on innovation. Florida needed a way to standardize transportation planning practices with 27 metropolitan planning organizations using multiple software models to forecast traffic. The Florida Model Task Force was created to advance transportation modeling using the Florida Standard Urban Transportation Model Structure. The task force brings together members from the metropolitan planning organizations, transit agencies, Florida Department of Transportation and Federal Highway Administration to cooperate on model development and applications. Task force input is valuable because traffic forecast models provide critical data for uses such as long-range transportation plans, road and interchange project development and toll feasibility studies. Regional models of collaboration enable transportation stakeholders to plan across jurisdictional boundaries. Through Every Day Counts, FHWA is working with the Federal Transit Administration to encourage transportation planners across the country to think beyond traditional borders and use regional models of cooperation to collaborate on multijurisdictional plans. Regional cooperation is needed to address today’s transportation challenges, said Petty. It can enhance economic development, improve freight movement, reduce traffic congestion and support a good quality of life. “Identifying opportunities to work together on regional planning where it makes sense can enhance the process and result in a better transportation system,” Petty said. Use of regional planning on highway, transit, freight and other transportation issues is a standard practice in 19 states, and metropolitan planning organizations, transportation agencies and other stakeholders in another seven states and Federal Lands Highway are conducting demonstration projects. Transportation stakeholders in 16 states have institutionalized the sharing of transportation data, models and tools, while another six states are at the demonstration stage. In addition to coordinating the Florida Model Task Force, the Florida DOT is conducting a pilot project with four metropolitan planning organizations—Broward, Gainesville, Hillsborough and Indian River—to explore data development for transportation-related performance measures. The project will help Florida prepare to adopt performance measures required by the Moving Ahead for Progress in the 21st Century Act. In Arizona, the Joint Planning Advisory Council, a partnership for the Arizona Sun Corridor, meets regularly to address regional planning and economic topics. These include the Arizona Department of Transportation’s passenger rail corridor study, border challenges and commerce flow, and creation of economic opportunities with infrastructure as a strategic investment. Representatives of Arizona’s six councils of government and eight metropolitan planning organizations meet for policy-level discussions on state and federal programs, such as options to address transportation funding shortfalls. Another Arizona group, the Transportation and Trade Corridor Alliance, is developing a statewide foreign direct investment strategy to identify approaches to enhance investment, such as transportation infrastructure projects that have potential as public-private partnerships. The New York State Department of Transportation is engaging metropolitan planning organizations and other stakeholders in development of a State Freight Plan. As part of the plan development process, the agency is conducting interviews with stakeholders such as modal associations on infrastructure, regulatory and other issues that affect freight movement in the state. The New York Metropolitan Transportation Council provides a forum to address transportation-related issues and develop regional plans for New York City, Long Island and the lower Hudson Valley. At the 2016 annual meeting, council members reviewed strategies for leveraging transportation investments to support the region’s growth and adopted the State Fiscal Year 2016–2017 Unified Planning Work Program. Contact Jody McCullough of the FHWA Office of Planning for information, technical assistance and training. View the webinar series on regional models of cooperation in transportation planning for examples of successful collaborative planning. See the Regional Models of Cooperation webpage for case studies and other resources. In Delaware, roadway departure crashes represent the largest percentage of fatalities, at 40 percent, and the second highest percentage of serious injury crashes, at 21 percent. Like many states, Delaware has begun installing high-friction surface treatments, a safety countermeasure aimed at reducing roadway departure crashes that could put a dent in the fatality number. HFST products consist of a thin layer of binder—usually urethane, silicon or epoxy—topped with specially engineered, durable, high-friction aggregates. The aggregate systems have long-lasting skid resistance, while making the pavement overlay much more resistant to wear and polishing. 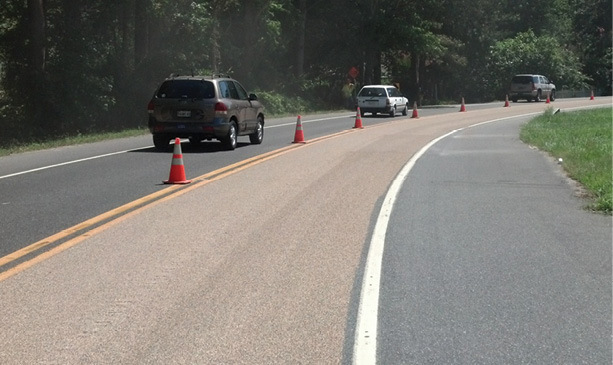 Crews apply high-friction surface treatment to enhance safety on a roadway curve. Up close: High-friction surface treatment consists of a binder topped with specially engineered aggregate, in this case calcined bauxite aggregate. The Delaware Department of Transportation has applied HFST at 15 locations, including curves where vehicles tend to lose traction and skid off the road. The agency started with a test location in Sussex County that had a high rate of wet weather crashes and roadway departures along a curve. “They put the product down in our test section and we looked at the crash data a year afterwards. We saw a reduction of about 75 percent in wet weather crashes and road departure crashes along that curve,” said Adam Weiser, safety program manager for the Delaware DOT. Through a review of crash data, the agency found that a significant proportion of fatal and serious injury crashes in the state were caused by wet weather. The Delaware DOT first heard about HFST from other states, and the Federal Highway Administration’s promotion of the technology through the Every Day Counts initiative helped heighten the department’s awareness of the innovation. A section of high-friction surface treatment applied in Delaware cures before the road is opened to traffic. The Delaware DOT used another EDC innovation, data-driven safety analysis, to determine where to apply HFST. The systemic safety approach to data-driven safety analysis identifies risk factors correlated with certain types of crashes, such as roadway departure crashes. The analysis is used to identify roadways that have risk factors similar to locations where roadway departure crashes have occurred. This approach is particularly applicable when a significant number of severe crashes occur over a wide area, such as rural and local roads. The Delaware DOT matches up the risk factors with crash data and then reviews the road inventory to find roads with similar risk factors. The Delaware DOT plans to complete eight more HFST installations this year. “Overall, we believe the HFST program is a success for the state of Delaware,” Weiser said. High-friction surface treatments, which offer skid resistance not typically provided by conventional materials, are catching on nationally. HFST technology involves applying high-quality, durable aggregates with a binder to provide long-lasting skid resistance at high-crash locations, such as horizontal curves, intersection approaches and downgrades. The treatments help motorists maintain better control in dry and wet driving conditions, reducing crashes, injuries and fatalities. They are relatively low in cost compared to geometric roadway improvements. The Federal Highway Administration highlighted the technology in the second round of Every Day Counts in 2013 and 2014 to encourage highway agencies to mainstream it as a safety countermeasure at spot locations. By the end of the two-year cycle, 37 states, Washington, D.C., and Puerto Rico were implementing HFST, up from 14 at the beginning. As of June 2016, 44 states, Washington, D.C., Puerto Rico, the U.S. Virgin Islands and Federal Lands Highway were using HFST. Of those, six states had more than 100 curves treated with HFST. The Louisiana Department of Transportation and Development plans HFST installations at 41 roadway curves. The Nevada Department of Transportation had its first HFST installation in summer 2016. The Georgia Department of Transportation awarded a project to treat 1.2 million square yards of pavement with HFST, the largest HFST project ever in the country. The Alabama Department of Transportation included 1 mile of HFST applications in a 15-mile pavement project. The Indiana Department of Transportation installed HFST for the first time this summer at multiple locations. The Arizona Department of Transportation is one of many state agencies using innovative techniques and tools to shorten the time needed for National Environmental Policy Act approval for construction projects. The agency rolled out a quality assurance and quality control process to help streamline reviews and approvals on environmental documents. The process promotes early and continuous coordination among project team members to identify and resolve schedule challenges. The Arizona DOT is also working on a reference tool for local agencies to guide them through the process of developing quality environmental documents. The tool is expected to reduce errors and the time needed for reviews and revisions. Improving collaboration and quality environmental documentation helps agencies deliver projects more efficiently. The Federal Highway Administration is encouraging strategies like the Arizona DOT’s through the Every Day Counts effort on improving collaboration and quality environmental documentation. The effort includes implementing best practices for developing quality environmental documentation, or IQED, and using FHWA’s eNEPA tool or other electronic documentation and collaboration systems to streamline environmental reviews. Strategies to implement quality environmental documentation are now a mainstream practice in 11 states and Washington, D.C. Another 16 states are piloting the use of IQED principles on NEPA documents or preparing for full deployment of IQED. Conducting NEPA review processes electronically is a standard practice in four states, while another eight states are demonstrating and assessing eNEPA or another documentation and collaboration system. The Alaska Department of Transportation and Public Facilities is working on an Environmental Procedures Manual that incorporates IQED principles, including developing clear documents that tell the project story, keeping documents concise and ensuring that they meet legal requirements. At Federal Lands Highway, applying IQED principles on all projects helps keep environmental documentation brief while ensuring legal sufficiency. An environmental assessment document for a project to improve Raphune Hill Road and Route 381 in the U.S. Virgin Islands is 32 pages and incorporates visualizations to help tell the project story. The Illinois Department of Transportation is collaborating with FHWA to develop templates for environmental assessments and environmental impact statements to help those who produce the documents make them clear, concise, consistent and legally sound. The Illinois DOT also updated the environmental policy chapters of its Bureau of Design and Environment Manual to include IQED principles and processes. The Mississippi Department of Transportation is finalizing an Environmental Policy Manual and a local agency training course on transportation project reviews under Section 106 of the National Historic Preservation Act. The Mississippi DOT used State Transportation Innovation Council Incentive program funds to develop the manual and training materials. New guidance developed by the Ohio Department of Transportation is aimed at improving the quality and streamlining the production of project feasibility studies and alternative evaluation reports. The Ohio DOT will use the guidance to produce reader-friendly documents that ensure efficient decision making. The agency added the guidance document to the topics covered in its project development process training and developed a web-based training class. The Washington State Department of Transportation uses several tools to improve the quality of environmental documentation, including a reader-friendly environmental toolkit, Environmental Manual, quality assurance framework and library of NEPA document examples. As part of its implementation of the Practical Design concept, the agency is focusing on improving community engagement in project processes, especially during the planning, environmental review and design phases. Contact Carolyn Nelson of the FHWA Office of Project Development and Environmental Review for information, technical assistance and training on using IQED principles. Contact Kreig Larson of the FHWA Office of Project Development and Environmental Review for assistance and training on using the eNEPA tool. Watch a video on how the eNEPA portal enables collaborative interagency reviews that can help save time and money on and improve the quality of NEPA documents. Read Preparing High-Quality NEPA Documents for Transportation Projects and Examples of Effective Techniques for Preparing High-Quality NEPA Documents, published by the American Association of State Highway and Transportation Officials. The 200,000th emergency responder has completed the Federal Highway Administration’s traffic incident management responder training course on techniques to clear highway incidents safely and quickly. Federal Highway Deputy Administrator David Kim leads a ceremony marking the training of 200,000 first responders in traffic incident management. The course helps build teams of police, firefighters, highway workers and emergency medical and towing personnel trained to respond to highway crash scenes. Participants learn a common set of practices, including quick clearance techniques that improve communication and reduce the amount of time needed to clear incidents from roadways. The life-saving training is part of a national movement to improve the safety of first responders and others on crash scenes. Responders in all 50 states, Washington, D.C., and Puerto Rico have completed the training. The delays caused by such crashes and other traffic incidents are responsible for about half of all traffic delays—which limit freight movement, increase worker commute times and decrease highway safety. “We are helping emergency responders learn safer practices at highway crash scenes,” Federal Highway Deputy Administrator David Kim said at a Washington, D.C., ceremony celebrating the training milestone. Joining Kim for the ceremony were representatives of emergency responder groups, including the International Association of Fire Chiefs, International Association of Chiefs of Police and Towing and Recovery Association of America. 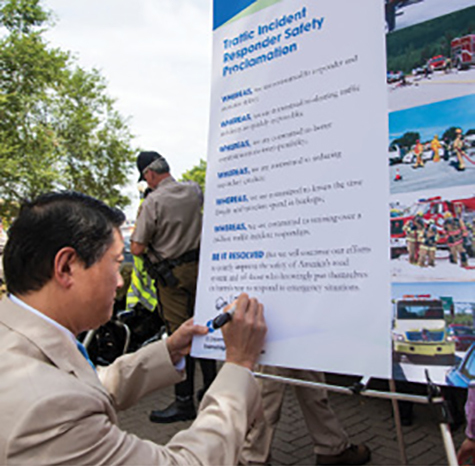 These organizations signed a Traffic Incident Responder Safety Proclamation as part of the national call to improve safety on the scene of highway crashes. 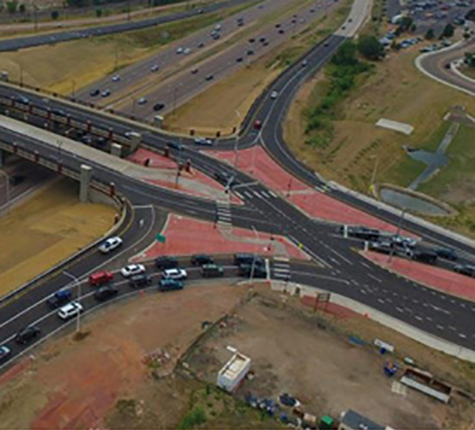 Colorado’s third diverging diamond interchange is open to traffic. The new interchange, part of the I-25 and Fillmore Street project in Colorado Springs, is designed to enhance safety and increase traffic capacity. The project included installation of a pedestrian walkway and bike paths. The Colorado Department of Transportation changed the original single-point urban interchange design proposed for the project when it recognized that a diverging diamond interchange could provide similar operational benefits and be built for about $35 million less. The Iowa Department of Transportation is the first state highway agency to require electronic signatures on all construction contracts. After conducting a successful pilot project on digital signature technology, the department began requiring electronic signatures on contracts in August. Contractors also submit insurance, bond and other required documents electronically. Adopting digital signatures on contracts is a major step in the Iowa DOT’s effort to implement e-Construction for project administration. The Omaha-Council Bluffs Traffic Incident Management Committee celebrated the signing of a memorandum of understanding by 35 member agencies at its August meeting. In the memorandum, the agencies pledge to work cooperatively on the traffic incident management program in the Omaha-Council Bluffs metropolitan area, with a goal of clearing traffic incidents as quickly and safely as possible. Committee members include the Iowa Department of Transportation, Nebraska Department of Roads, Omaha-Council Bluffs Metropolitan Area Planning Agency and city and county agencies. The Michigan Department of Transportation is reconstructing the M-86 bridge over the Prairie River with the help of Accelerated Innovation Deployment Demonstration funds. The new bridge will be Michigan’s first using carbon fiber composite strand reinforcement and one of only two bridges in the state with concrete bulb tee beams. The innovations are expected to help reduce the concrete cracking, deterioration and corrosion typical in traditional steel-reinforced bridges, which can save money for taxpayers. Innovator, published by the FHWA Center for Accelerating Innovation, advances implementation of innovative technologies and accelerated project delivery methods in the highway industry. Its audience is transportation professionals in highway agencies, trade and research groups, academia and the private sector, and the driving public.